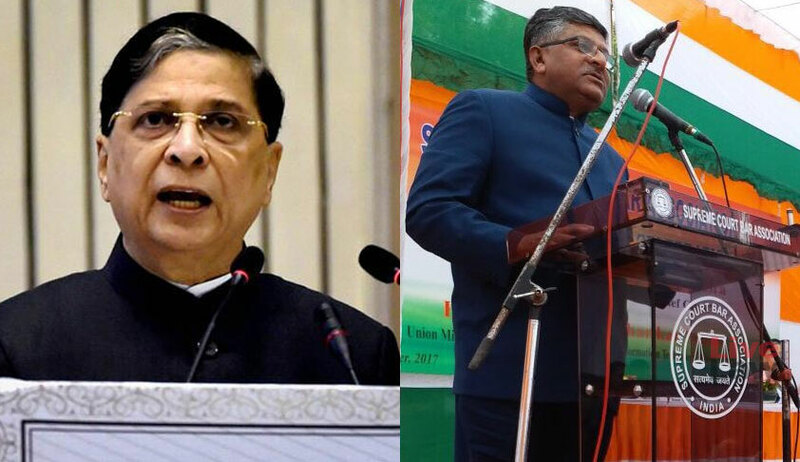 At the Law Day function held by the Law Commission of India on Sunday, Union Law Minister Ravi Shankar Prasad and Chief Justice of India (CJI) Dipak Misra got into a spat over judicial overreach and ‘repeated crossing over of the constitutional boundaries by the courts’. Speaking at the event held at Vigyan Bhawan in New Delhi, Law Minister Prasad said he has a lot of respect for people who file PILs for public cause, but “PILs should not be allowed to be used as means for substitute of governance”. “The founding fathers of Constitution had advocated that governance should remain within the realm of those who are elected by people and are accountable,” Prasad said, adding that “reckless allegations should not be the benchmark. The whole world is watching at us. India is going to be a superpower. We need to work for new emerging India”. He even brought up the case of retired Justice CS Karnan. Referring to the apex court’s decision sending then Calcutta High Court judge CS Karnan to jail for contempt of court, Prasad said the collegium, while recommending him for elevation to bench, had opined that he was well versed with all branches of law, but it was the same Supreme Court that sent him to jail for contempt of court when he was a sitting judge. He referred to several PILs and various judgments of the courts to illustrate how the courts never crossed the Lakshman Rekha. “When there is a need for protection of fundamental rights of citizens, the judiciary’s paramount duty is to protect them,” Justice Misra said, adding that judiciary has no intention to enter the area of policy-making. He advocated for mutual respect for each other by the three pillars to maintain constitutional ethos. Meanwhile in his valedictory address, Prime Minister Narendra Modi urged all three organs of the state to work together within the constitutional boundaries neatly demarcated to achieve the goal for New India. He emphasised on the separation of powers for legislature, executive and judiciary provided in the Constitution and vouched for coordinated efforts of all three organs for accelerated growth of India. “Legislature should independently make laws, executive should independently be allowed to implement and similarly, judiciary should interpret the Constitution and laws unhindered to make new India,” Modi said, while asking all the pillars to take a pledge to work together and fight against the existing challenges for “ease of living of people”. He appealed to all for a change of the mindset and leave the ‘mera kya and mujhe kya (what will I get out of it and if there is nothing for me, then why should I care for it)’ approach. Praising the makers of the Constitution for successfully completing the task of framing it in this diversified country, Modi said the Constitution has withstood the test of time. Reiterating his government’s commitment to the people of this country, Modi said his government is planning for elections in states and Centre to be conducted simultaneously so that the financial burden on the government would be drastically reduced. There is a need for a debate on the issue, he added. Earlier at the function, President Ram Nath Kovind also emphasised on the separation of powers defined in the Constitution to uphold the rule of law. “All three organs are equal and they should be conscious about their responsibilities and areas,” he said. Speaking on the challenges like huge pendency of cases, he said strengthening of the infrastructure and the use of latest technology will take judiciary a long way. He further suggested the use of local language by the courts for better understanding of litigants. He also expressed concern over the alarming pendency in the courts.